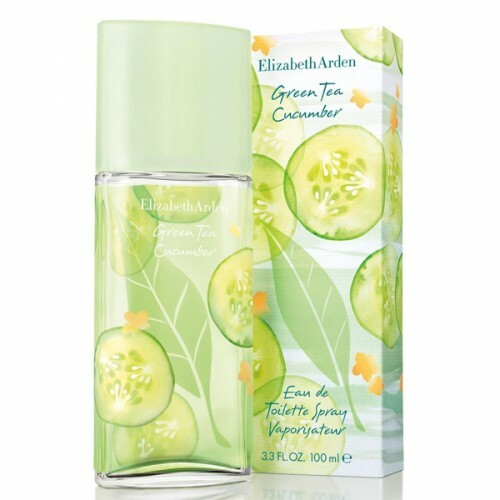 Elizabeth Arden Green Tea Cucumber will surprise you with its unusual juiciness. Elizabeth Arden Green Tea Cucumber 100ml. Eau De Toilette evokes a cool lemonade, hot day that refreshes your senses. This unique feminine scent immediately fall in love and become your indispensable companion during the summer! Beginning unique eau de toilette Elizabeth Arden Green Tea Cucumber opens refreshing cucumber and citrus energetic that will surprise you with its unusual juiciness. Delicate Heart fragrance conceals a sweet melon, which perfectly combines with playful violet. Base fragrance is composed of marshmallow sensual and intoxicating amber. Unique combination of carefully selected essence creates a very pleasant aroma. Exclusive women's fragrance Cucumber Green Tea was launched in 2015. The cool ladies Eau de Toilette Elizabeth Arden Green Tea Cucumber hiding in a glass bottle, which is decorated with motifs of cucumber and green tea leaves. This fragrance will give you the perfect refreshment anytime, anywhere. Surround yourself with the unique aura of freshness and forget your worries with a unique toilet water Cucumber Green Tea by Elizabeth Arden! What is summer? Summer - a juicy fruit, hot nights, full of romance, charming holiday romance, and ... cucumbers. That is, apparently, decided to creators of this toilet water Cucumber from the well-known series of Green Tea by not less than the popular American brand Elizabeth Arden. Well-known recent "tea" fragrance added in 2015, the younger brother, which fit so well in the format of the summer fragrance that is likely to soon surpass predecessor green! The starting sheet - the very thing that surprised many a combination of cucumber and citrus. Surprisingly, they sound very harmonious and even gentle, fresh and subtly, to be replaced later in the "heart" of the classic for the series note of green tea. The fragrance can be described as very fresh, but immediately manifests itself and gentle violet, sweet and ripe watermelon - all, without which no one can avoid the summer! Subsided flavor to sit close to the skin, wrapping your delicate veil of amber and ambrette, as if alluding to a romantic night walks and visits.